I thought I would do a quick post about a program that I’ve been using for awhile now that I’m using as a substitute for iTunes when I transfer music to my iDevices (iPad2 and iPhone4). The program is amazing and it’s free; it’s called CopyTrans Manger. CopyTrans Manager has worked seamlessly for me. There are a number of other products available for this, I’ve tried them all (or so it seems…), and this program definitely has had the best, most consistent, results for me (i.e. it works almost without hassle). In addition to the CopyTrans Manger program, there are a number of other “trial” programs that that they offer in a suite that are all very useful -especially with regard to moving libraries from device to device and/or restoring or recovering your music. Personally, I find iTunes to be particularly clunky as a PC user with regard to freely moving my music about and getting my existing CD/MP3 library onto all of my devices quickly. 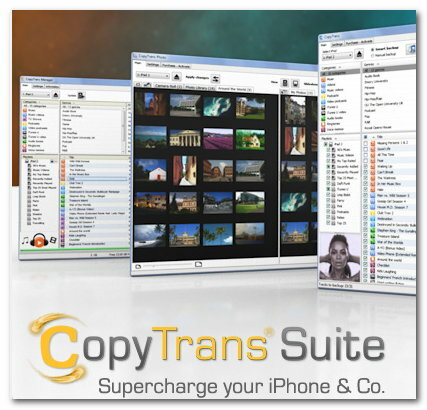 CopyTrans Manager is as simple as “drag and drop”. Also, it is very easy to edit the metadata and/or album artwork using their “multi-edit” button. In the end, it is a solution that works well for me. I still use iTunes, but primarily for syncing and backing up apps (although much less now with the untethering/iCloud options added in iOS 5+). Finally, I thought I would share my two favorite CD rippers: CDex and Exact Audio Copy. They are both fine audio rippers and allow for multiple codecs to be selected for compression (if you have them installed) . I find myself using Exact Audio Copy (EAC) more of late because of the ease it provides for finding album art and lyrics and attaching them to the meta data (ID3 tags).